Lowdown: The autobiography of the nice person behind the PC revolution. I suppose I could say that growing up at the time I grew up, there to watch computers invade the home, makes me a lucky guy. Hey, it’s much better than running in and out of caves with no running hot water. Seriously: even though I may have not realized at for quite a long time I, love computers. Learning to program them in various ways was one of my teens’ highlights. Today, both my mortgage and my favorite activities of leisure owe a lot to those experiences of yonder. And although I didn’t know it at the time, those privileges put me in debt of a small group of people, the people who made this all possible. Chief amongst them is the guy that singlehandedly brought the computer home, properly: Steve Wozniak (with a little help from another Steve). I knew enough about Wozniak to know that I wanted to know more about the man. The guy reminds me of myself, to one extent or another: loves computers and tinkers with them, has a reputation for being shy and reclusive, and is working on his application for a visa that would allow him to move to Australia. More importantly, Wozniak, or just Woz, has a universal reputation for being a nice guy; not that many people manage to get to the top and maintain such a reputation. Surely, the guy is special. Surely I will find learning more about him interesting. Thus when I found that option was available to me since 2006 in the form of iWoz, his autobiography, I put it high up my reading list. Told using very simple language, out of what seems to be oral interviews with Gina Smith which were later put down to paper, iWoz tells us the way things were in first person. Much like Steve Jobs’ biography, this autobiography portrays the image of a child lucky to spend his childhood at a certain location and in certain circumstances that made him what he now is. Also, by the way, a child lucky to live with loving parents. Things hot up pretty quickly as we learn about the events that led to Woz’ big bang, the design and creation of the first Apple and then the Apple II. Later we follow up on Woz’ version of his relative distancing from Apple, his marriages and breakups, his career as the producer of musical events, his accident, his kids, and much more. The historical importance of Woz’ feats is undeniable. Through his personal design breakthroughs he got us the computers we now take for granted: computers connected to a keyboard on one side for an input and a screen on the other for output. A color screen at that! Not to mention other breakthroughs, such as the floppy disk drive. It would have all happened, eventually, but it happened faster than otherwise possible through the genius of one man. Being able to hear from that man’s mouth about these historical breakthroughs is one reason iWoz is well worth reading. I would suggest, however, that the most important contribution iWoz makes is in letting us know, both in fact and opinion, what it was that allowed Wozniak to come up with his brilliance. He talks a lot about his parents and his school career, but at the book’s conclusion he lays it there for all to see: innovation was possible because he worked on his own and he followed his dream; it would have been effectively impossible were he to do the same type of work at a large company, in a team, and while following company protocol. Innovation requires passion, and organized work murders that passion. I very much agree; and I also think this insight has plenty of implications on the way we should lead our lives to their maximum potential and the way we should educate and raise our children. 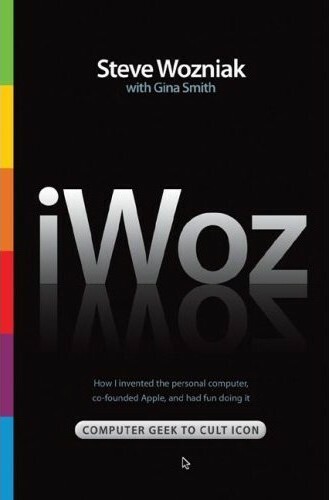 Philosophical insight aside, reading iWoz one can clearly see how Wozniak acquired his "nice guy" reputation. It is simply amazing he managed to keep this state of mind through the highs and lows of his life (and the inevitable comparison with that other Steve tells us a lot there). He’s not only nice, though: he’s a man of his word and quite the philanthropist. I think what I’m trying to say here is that long before I finished reading iWoz I felt like I want to seek me Wozniak out so I could give him a hug. Overall: This personal tale of one of the Information Age’s pioneers is both interesting and fun to read even if it is not written to Christopher Hitchens’ level of English mastery. 3.5 out of 5 stars. 11/5/2013 update: Oddly for yours truly, I neglected to mention Wozniak's professional career as a producer of electronic gadgets started with a device to hack the phone system and make free calls. In other words, Wozniak is a hacker; a more or less ethical hacker, according to his account, but a hacker still. A hacker that by today's standards would probably spend a lot of time in both court and jail.